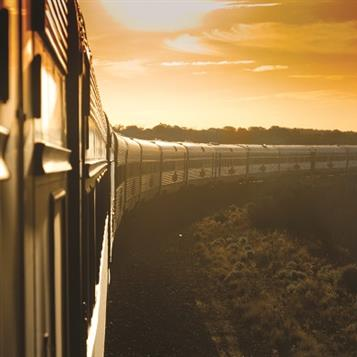 The Indian Pacific is one of the world's longest train journeys travelling trans-continentally coast to coast between Sydney on the Pacific Ocean through the Blue Mountains and across the treeless plains of The Nullarbor to Perth on the Indian Ocean. There are many things to see along the way as you cross this vast, spectacular country with scheduled stops and optional sightseeing tours en route including the 'Silver City' mining town of Broken Hill, metropolitan Adelaide, gold-rich Kalgoorlie and Cook a remote outpost on the Nullarbor Plain which has a population of just two! The Indian Pacific travels one or two times per week in either direction (depending on the season), covers 4352kms and takes two days/nights between Perth and Adelaide and one between Adelaide and Sydney. As we can book many months in advance of travel and, subject to availability, there are various Discounted and Advance Purchase Fares offered, the earlier you book, the better the fare! Platinum Service also offers premium level comfort of a truly global standard. Platinum Service guests are also treated to private transfers to/from the hotel or airport pre or post-journey and also benefit from increased checked-in luggage allowance (3 x 25kg bags per person). When making Platinum Service bookings please advise the locations for pick up and drop off at time of reservation. Private Carriages - for the ultimate experience in luxury, ask about your own Private Carriage, perfect for groups of up to 6 or 8 people. Available for meetings, parties or just a special family occasion, there are four Special Carriages to choose from each with their own characteristic charm.